All hail the 150-day battle! If it can finish the business that all started with the disastrous investments for the 1989 Youth Games, someone should be very pleased. However, the Herald reports that only one side of the building has thus far been completed, leaving it open to doubt if it will take another twenty years to shield the remaining two sides of this eyesore. Pyungyang News – Ryukyung Hotel or Ryukyung Tower? One day in July, at around 5 am, the Pyung-Kang (Pyungyang – Kangye) train slowly approached the main terminal in Pyungyang, cutting through thick fog. After a big stretch to awaken my muscle, I collected my luggage and stepped out of the Sleeper (Hard) train. It was a homecoming for me after a year. Last year I worked on the design, construction and review process of hydroelectric power plants in the northern area and went to various hydroelectric power plant construction sites located in the provinces of Jagang, Ryanggang, and North Hamgyong Province, for about a year. My return to Pyungyang was due to personnel rotation. At the platform a staff from our department was waiting to welcome me. The car was a Whistle. I asked what had happened because when I was here it was a Nissan. When we arrived at Sinseol Bridge over Botong River, the gigantic Ryukyung Hotel appeared before my eyes. Up until a year ago, Ryukyung Hotel looked gawky, but now glasses were installed and the crane at the top of the building was gone. It had been completely upgraded. In its original blue print, the Ryukyung Hotel had over 5,000 rooms, and about 47 elevators. I was curious how it had changed. “Now that you are saying Chairman Kim commanded, I have nothing further to say. But don’t you guys have common sense? How could you do this?” I spilled out all my concerns. 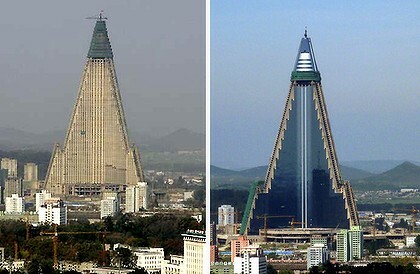 How come Ryukyung Hotel, symbol of the “Strong and Prosperous Nation” in Year 2012, has turned into a grotesque tower? No matter how insufficient money is, what a shame! We can no longer boast about the Ruykyung Hotel in the future. Perhaps this man could have kept up with the construction of the hotel if he had been able to follow progress via the Internet, as the Ryugyong Hotels has its own dynamic website.